The Game Center is an app that comes preinstalled with iPad (iOS 4.2 and later). If you’re into gaming, you may enjoy the features it offers that allow you to challenge friends to beat your scores; buy games; and keep track of your games, friends, and achievements. Of course, you can also download games from the App Store and other online game stores and play them on your iPad without having to use Game Center. 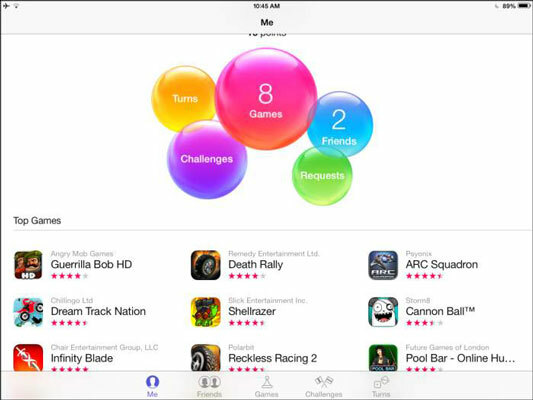 What Game Center provides is a place where you can create a gaming profile, add a list of gaming friends, keep track of and share your scores and perks, and shop for games (and only games) in the App Store, along with listings of top-rated games and game categories to choose from. Think of the Game Center as a kind of social networking site for gamers, where you can compare your scores and find players to challenge. The Achievements listing shows you your score history for all the games you play. Finally, Leaderboards allows you to compare your performance with your gaming friends. Me: Contains your profile and summary of number of friends, games, and achievements. Friends: Tap to invite friends to play. Games: Takes you to iTunes to shop for games. Challenges: Friends can challenge their friends to do better than they did. Tap a friend’s score in the Friends area of Game Center to challenge her. Turns: Shows you any requests from your friends for a game. Game Center’s opening screen shows an overview of your friends, games, and achievements.